A .357 magnum is a reliable sidearm that with proper care and cleaning will last a lifetime. Cleaning the firearm only takes about half an hour, but this preventive maintenance will pay off in durability, accuracy and dependability. The most important step to take in cleaning any weapon is to be absolutely positive it is unloaded before you begin any work. 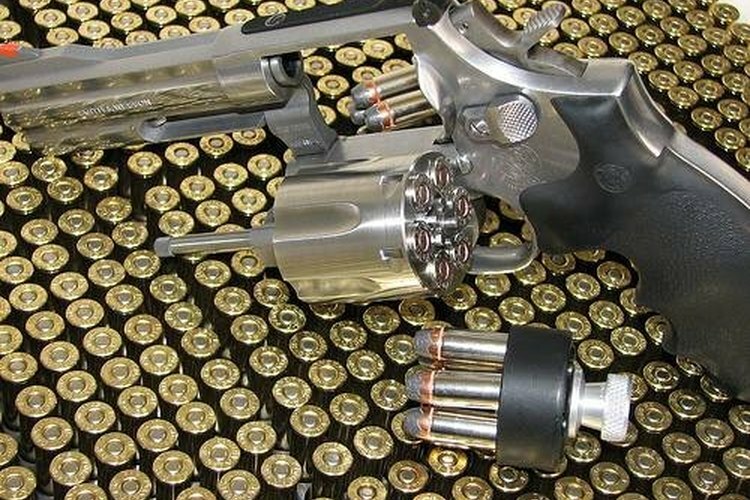 The .357 magnum is a revolver weapon that fires six shots before reloading is necessary. Before cleaning the weapon, it is vital to verify that all six chambers are clear. This means that spent cartridges must also be removed. It's not worth your life to take a chance on a live round slipping in the chamber. It only takes a minute to unload the weapon, which must be empty so that all six chambers can be cleaned properly. Buy a revolver cleaning kit for the .357 caliber magnum. This will have all the cleaning supplies and tools you'll need to clean and maintain the revolver. Tie a rag through the cylinder opening to prevent the cylinder from being closed while cleaning. This makes it impossible to fire the weapon. Dip the barrel bore brush in cleaning solution. Twist the brush into the full length of the barrel, pulling the brush up and down all the way out of the barrel and all the way back in. Insert a cleaning pad dipped in cleaning solution and work it with the barrel bore brush up and down the inside of the barrel. The brush should be inserted all the way to the cylinder at the back of the barrel and pulled all the way out again to ensure a thorough cleaning. Repeat with additional cleaning pads until all dirt is removed. Clean the barrel muzzle with a brass bristle brush (included with most cleaning kits) that has been dipped in cleaner. Clean the back and outside of the cylinder with a bristle brush and cleaning solution. Clean each of the cylinder chambers and the cartridge ejector rod with cleaning solution and the bristle brush. Use a dry, clean, lint-free cloth to wipe down the gun and remove all cleaning solution. Rub down the metal parts of the weapon with gun oil, taking care not to get oil inside the barrel or inside the .357 cylinders. Polish the gun with a clean cloth to remove excess oil. For safety, keep all ammunition out of the cleaning area. Be positive the weapon is unloaded before attempting any work.